VietNamNet Bridge – Analysts, while forecasting the arrival of many foreign fast food chains in Vietnam, believe that the real estate market would warm up in the war among the chains for retail premises. There have been no positive forecasts about the recovery of the national economy in 2013. However, there have been a lot of pieces of news about the presence of international fast food chains in the near future in Vietnam. Local newspapers these days repeatedly report about the plans to expand the networks of BBQ Chicken, Lotteria and Burger King. The information coincides with the result of the latest survey conducted by FTA, a market survey firm, about the Vietnamese consumption tendency. 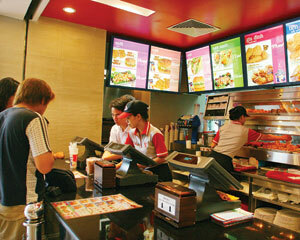 The survey showed that the year 2013 would witness many more franchising agreements to be signed. Woo Gil Je, Director of BBQ Vietnam, a subsidiary of Genesis Group of South Korea, said a lot of investors have contacted the company to ask for investment cooperation. The investors have expressed their willingness to set up BBQ Chicken shops in HCM City, Hanoi, Da Nang, Hai Phong and Can Tho. The director feels satisfactory about the suggestions for cooperation, saying that the places suggested by the investors are suitable to the BBQ Chicken’s business expansion strategy in 2015-2020. BBQ Vietnam has been put under the direct management of the South Korean Genesis Group since the beginning of the year. Prior to that, the group signed a franchising contract with an individual who committed to develop BBQ Chicken brand in Vietnam. Also according to the general director, in the plan to expand the network, the company would make heavier investment, push up media campaigns and improve the menus to make the dishes more suitable to the Vietnamese market. Especially, he said, BBQ Chicken would develop new shop models – Chicken & Beer and Premium Coffee, and set up small scale shops at shopping malls and residential quarters. The fast food chain not only targets big cities like Hanoi and HCM City, but is considering marching towards the markets near Hanoi such as Hai Duong, Hai Phong, Quang Ninh, Ninh Binh, Phu Tho and Thai Nguyen. After 7 years of making its presence in Vietnam, BBQ Chicken has had 17 shops in Hanoi, including the 11 ones operating under the franchising contracts. The franchising fee is about $42,000 for the shop on the area of less than 30 square meters, $53,000 for 80 square meter shops, and $87,500 for 130 square meter shops. These include the brand fee, training fee, deposit, interior designing and opening fees. KFC and Lotteria made their presence in Vietnam sooner than BBQ. However, they don’t “sell” brands like BBQ, but have been doing business and managing the networks of shops themselves. In 2011, when its 100th shop was opened, Lotteria announced that it was ready to franchise 100 percent or a part of its business. However, in late 2012, Lotteria announced the delay of the franchise plan to 2013 due to the economic difficulties, because of which it still could not find investors. However, it seems that Lotteria has to speed up its franchise plan when the two redoubtable rivals from the US, McDonald’s and Burger King have shown their clear interests in the Vietnamese market. General Director of Lotteria–Cho Young Jin, said the fast food chain plans to have one shop for every 160,000 consumers.